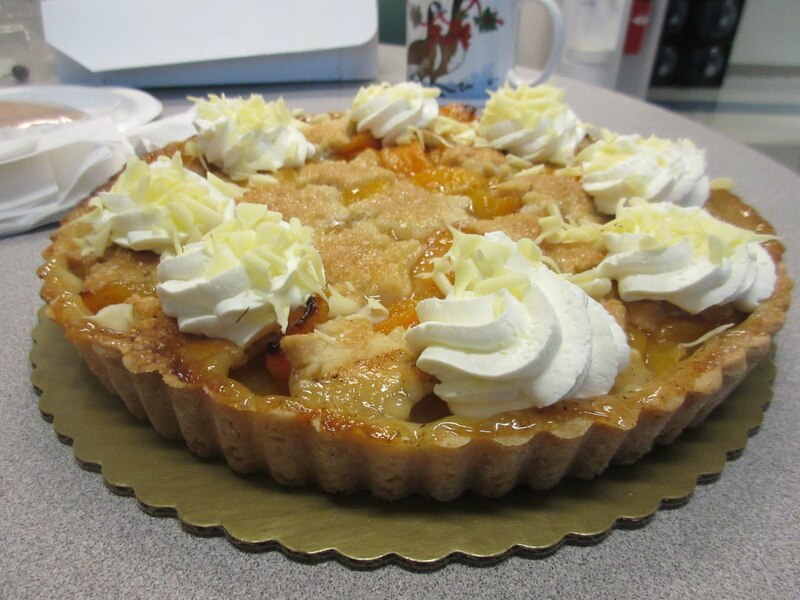 Peach tart from the Vienna Bakery and the fruit is gone. 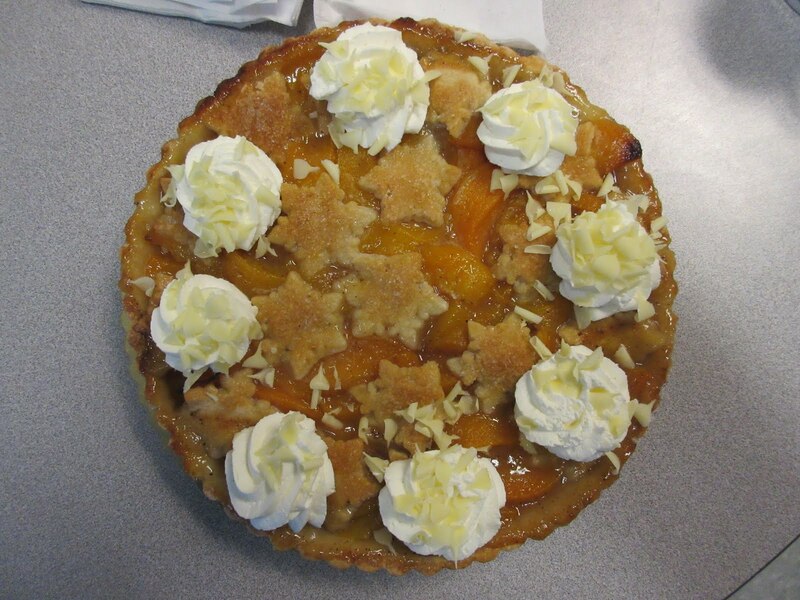 Today we had yet another creation of the Vienna Bakery in Barrington - one of our faves. They make quite a number of fruit tarts with our most popular being the frangiapane or pear tart. This time around they came up with a peach tart and it looked very tasty right from the start. Another great looking concoction from the Vienna! Classic flan/tart shape for the cruust! 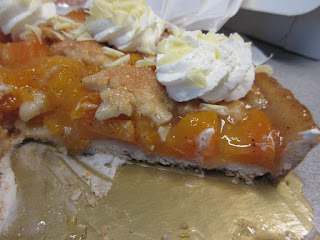 It had the classic flan type base crust topped with a fruit mixture and not a layer of pastry cream first. The mixture consisted of sliced and glazed peaches. Embellishing the top there were a number of dough stars and then some obligatory whipped cream florets and a few white chocolate curled shavings. 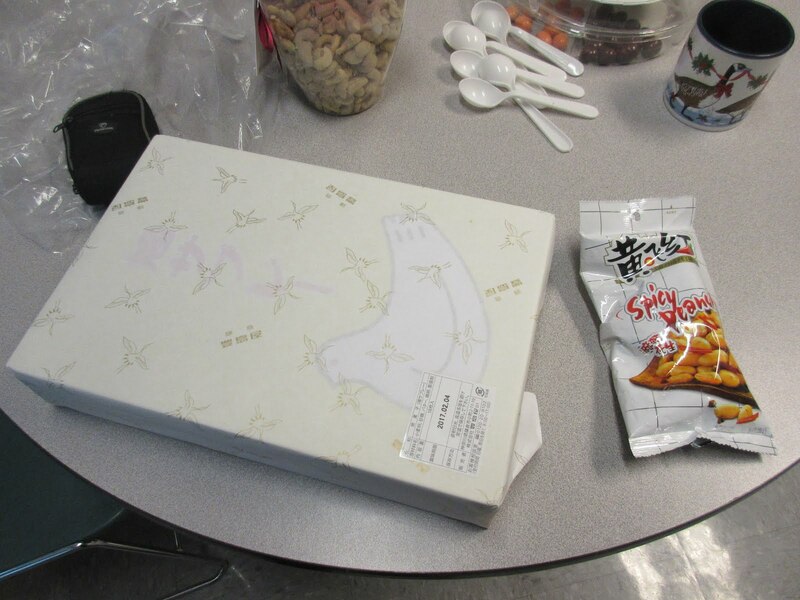 And of course, true to just about all their products, it was delicious!! Their stuff is never too sweet. Something to highly recommend. Thanks, Vienna Bakery, for another awesome treat. Crust topped with fruit minus the pastry cream. Oh and for the record, the chocolate covered fruit is gone. 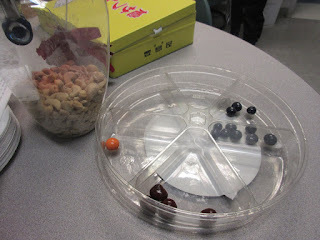 The last two blueberries were consumed today. This stuff did not prove to be the most popular but we finished it off! Leftover Dove cookies and the choc covered fruit is almost gone! Quite day today at cake hour. We had some new Cinnamon spice cookies but since we hadn't finished off the dove cookies, we decided to just go with them. They tasted just as good as they did yesterday. Today's offering with some Kamakura leftovers! Not quite so many in the box! Go to yesterday's post for the full story!! Didn't have to break into these yet! Oh, we are also close to finishing off the chocolate covered fruit that was started back on January 5th. It's taken awhile but we are getting through it! Hard to believe there is still something left! 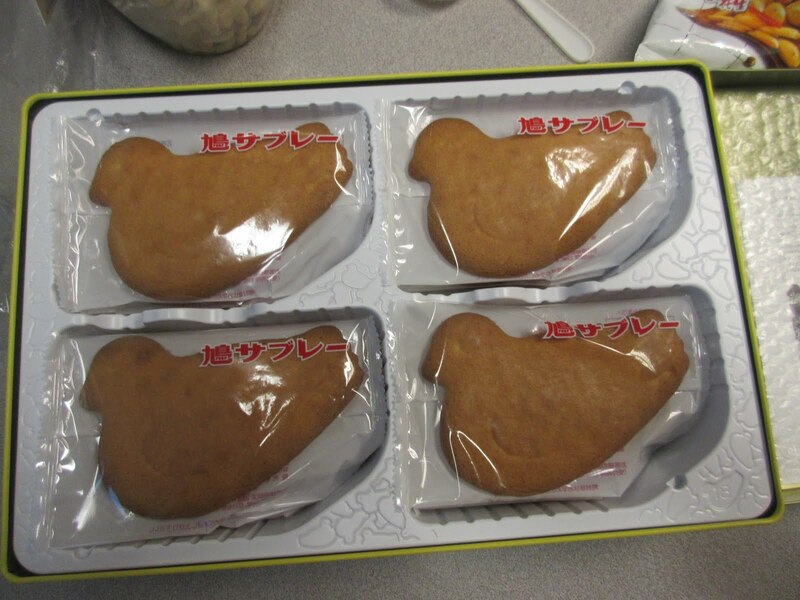 The 100th anniversary of pigeon biscuits!! I'll bet you didn't know that Pigeon Biscuits have now been around for 100 years having been first produced in 1916! 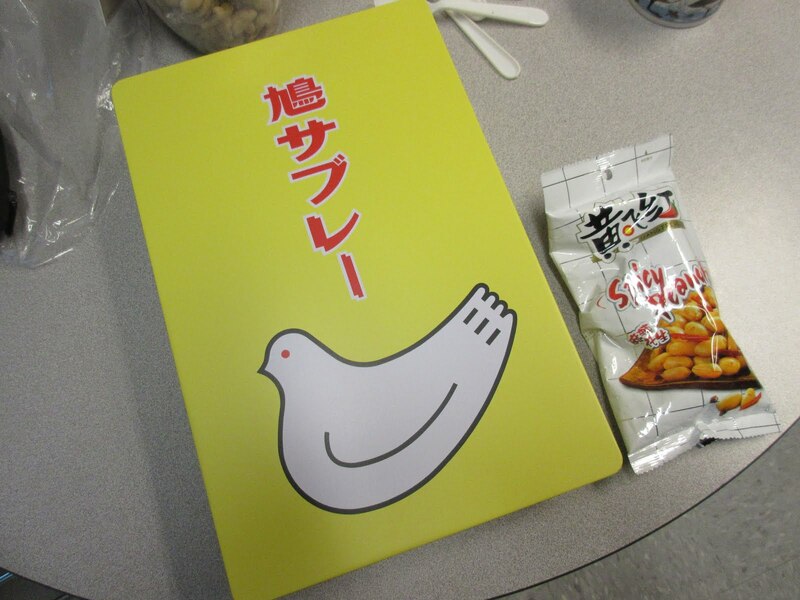 What, you don't know what a pigeon biscuit is? Neither did most of us but we learned. Actually pigeon biscuits is one way of referring to them. 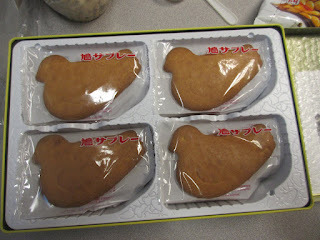 Another way, maybe more appropriately would be Kamakura Dove Cookies aka Hato Sabure (鳩サブレー)! They are apparently a specialty of Kamakura. They are produced by the Toshimaya company. 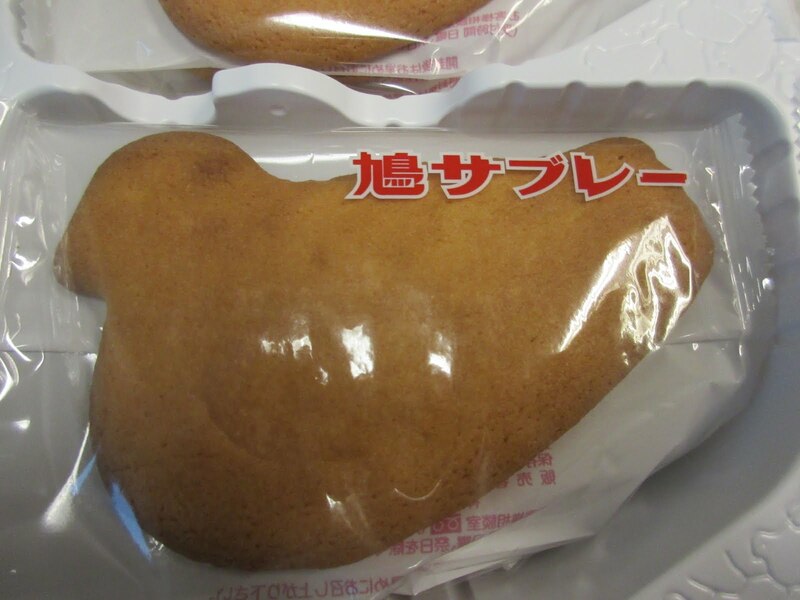 They are based upon a cookie that the founder supposedly received from a foreigner. 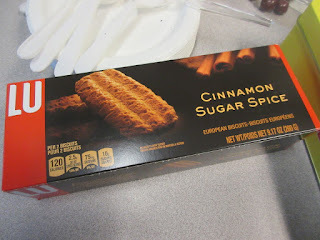 He tried to emulate the cookies and came up with something that was said to taste like a French sable biscuit. (Sabure is the transliteration into Japanese of sable). The original store was reportedly located near a shrine where children interacted happily with pigeons. 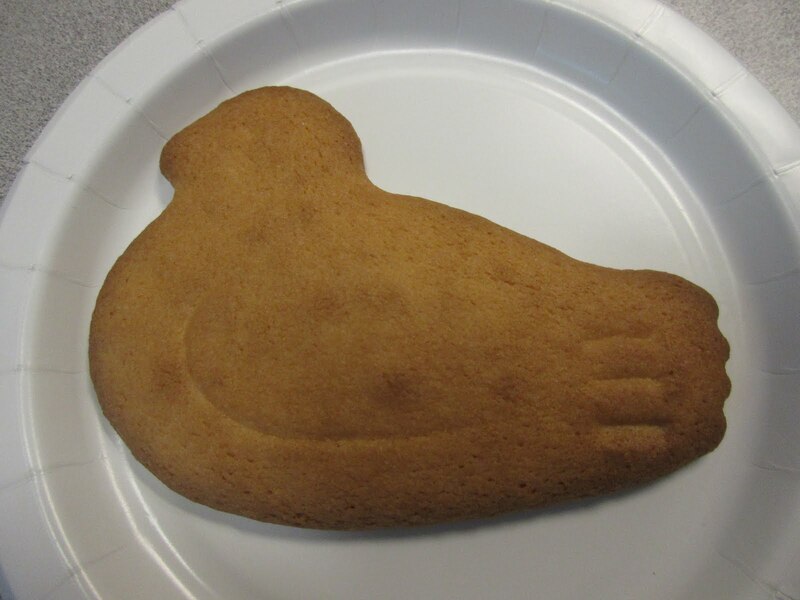 This inspired the owner to shape the cookie like the bird and the rest is history. They are hugely popular in Japan and rarely seen in the US unless someone brings them as a souvenir and that is how we came upon them. Today's treats -what's in the wrapping? It's a unique yellow tin with a bird image! 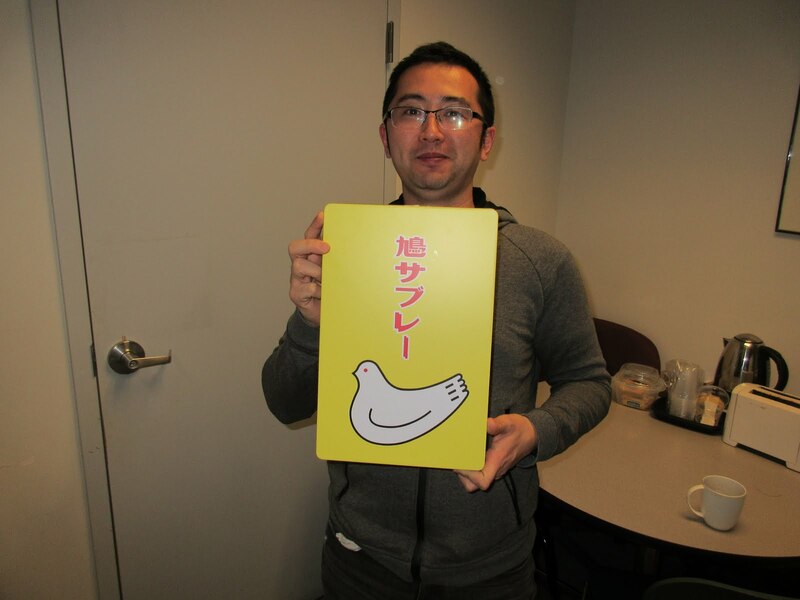 Brought to you by one of our colleagues from Japan. And inside are four slots of the famous cookies! They are very crunchy and buttery and apparently only four ingredients are included butter, flour, eggs, sugar and nothing else. So they are like a cross between a shortbread and a vanilla wafer! They were quite good and we learned something very special about Kamakura today. 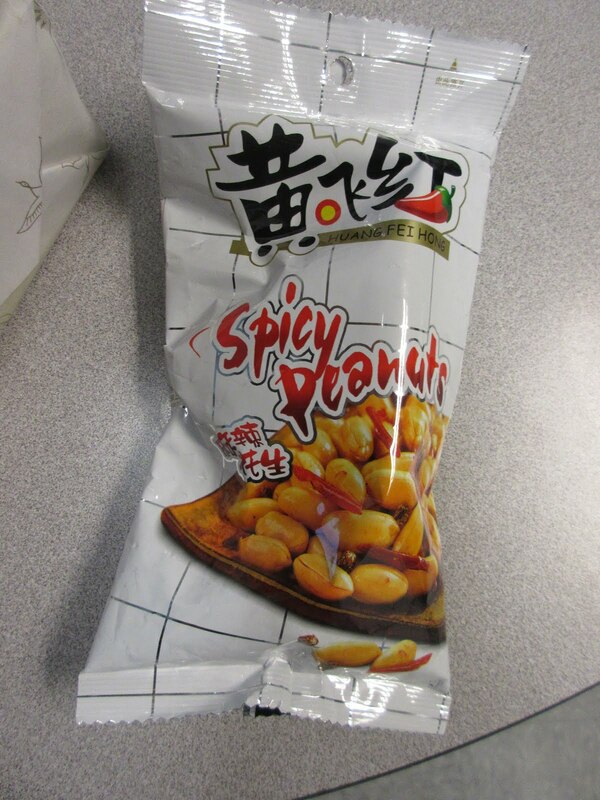 To balance off the cookies we had some spicy peanuts. We had had these before and they were a bit of a hit so our colleague ordered some more online. These are regular peanuts with a few kinds of hot peppers. One is like the regular cayenne red peppers and another is this small green thing that slightly numbs the tongue if you eat it alone. The Japanese refer to it as mountain pepper or Sanshoo sansho. All together it makes for an interesting nut treat. Also had a return of some uniquely spiced peanuts from Taiwan! The small green things are the Sanshoo. It tingles the tongue when you eat it! It's after Christmas but time for Lebkuchen! Once of the ubiquitous treats in Germany at Christmastime is Lebkuchen. It is ubiquitous all year round in Nürnberg where it is considered a local specialty. As a matter of fact: Lebkuchen was invented by monks in Franconia, Germany in the 13th century. Lebkuchen bakers were recorded as early as 1296 in Ulm, and 1395 in Nürnberg (Nuremberg) which is the most famous exporter today of the product known as Nürnberger Lebkuchen (Nuremberg Lebkuchen). It is similar to gingerbread. The most common ingredients include honey, spices such as aniseed, coriander, cloves, ginger, cardamom, and allspice, nuts including almonds, hazelnuts, and walnuts, or candied fruit. 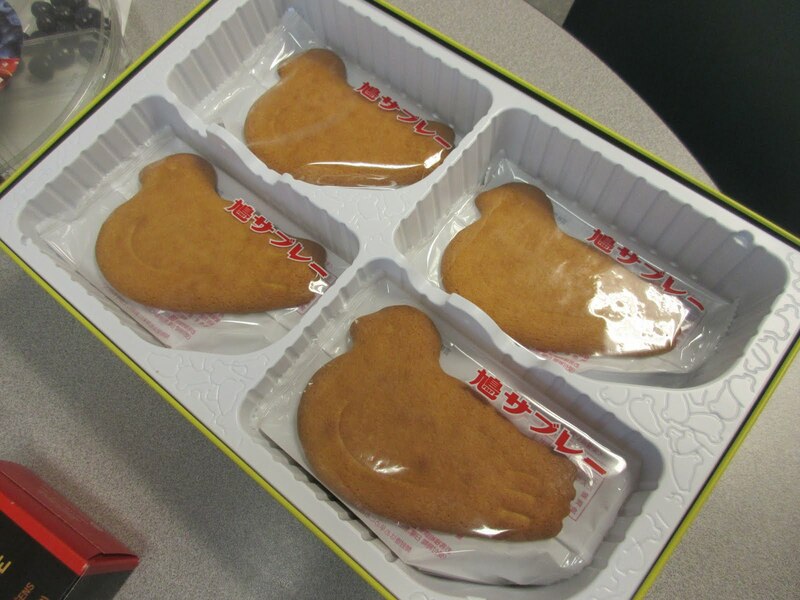 One fun thing about them is that they frequently are baked on a sugar wafer very reminiscent of the host at the communion in the Christian church. On a recent trip to Germany we picked up some at a small store in the Großhadern section of Munich which is run by a cousin. When he finds something he likes anywhere in Germany he then proceeds to bring the product, which he thinks is the best ever, to the store to sell it. Today's chocolate covered variety were made at Konditorei Cafe Finger in Hofheim, Germany which is near Friesenhausen where he has a large estate type of property. Five good size cakes to try. Can be a number of different coatings - this was dark chocolate. The thin wafer layer on the bottom like the Communion host. 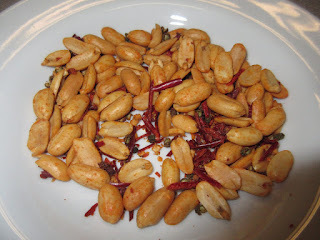 The taste was typical, bit of a spice cake with hint of orange and ground nuts. The dark chocolate coating was particularly nice. Summing it up they were very good. The best ever? We are not so sure. Scialo Brothers Bakery on Federal Hill in Providence has been around for awhile. They are a more traditional Italian bakery that makes some great unique products. They are also the only bakery that we deal with that still wraps the box of the cake with string. We have had a number of their coffee cakes which are huge. Today we were treated to something that we hadn't seen before - a walnut cranberry cake. Since1916 so they should know what they are doing! Haven't seen this one before! Impressively topped with nuts and cranberries! It is a basic yellow/vanilla cake but it is covered with a thick layer of walnut halves and dried cranberries sealed together with a caramelized brown sugar glaze (we think that's what it is). It is impressive looking to start with. The topping is almost as thick as the cake. Plenty of nuts and berries caramelized together. 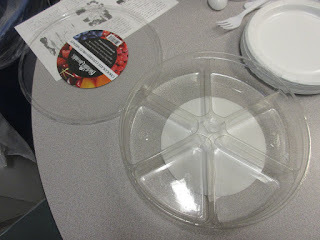 The cake was not very thick which was a good thing but it was very fresh, very moist and not very sweet. The cranberry and walnut topping was awesome - crunchy and tart and it went with the soft melt in you mouth cake very well. This was a Scialo brothers hit. As you can tell from the number of people, it was very popular. Good moist yellow cake as the base. If you look at today's cake and think it looks familiar that is no surprise. Just like yesterday's pecan tart this one comes from the Vienna Bakery making this day 3 of our inadvertent Viennese theme. In fact it looks very similar except that the filling is like that for a blueberry pie and there is streusel on top instead of baked in pecans. Even the whipped cream florets are, well, the same. Similar to the decor on yesterday's pecan tart, don't you think? And that crust looks familiar too! We have nothing against this. If they prepare a bunch of tart crust bases and then fill them with various things that is perfectly okay with us. We have seen similar things with cranberries and apples so they are pretty versatile. This was no exception to their usual superior quality and was, again, not as heavy or caloric as an actual pie might have been. Nice streusel top and some white chocolate shavings! Just enough of the filling...again! 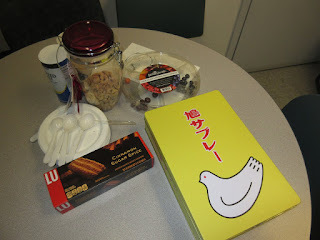 Incidentally, the reason we get so much stuff from the Vienna Bakery is because it is in Barrington, RI and we have a number of colleagues and lab people who live in the town. As a matter of fact it has the highest number of people with an advanced degree, PhD, in all of Rhode Island. We are happy that some of our folks are contributing to that distinction for the town. Yesterday's lemon tart was Viennese. So I guess today's pecan tart from the Vienna bakery in Barrington would also be Viennese? A Viennese, er, Vienna Bakery pecan tart. Not too deep with some schlag florets on the top. Looks just like a pecan pie! As opposed to a pecan pie this is very much a tart. 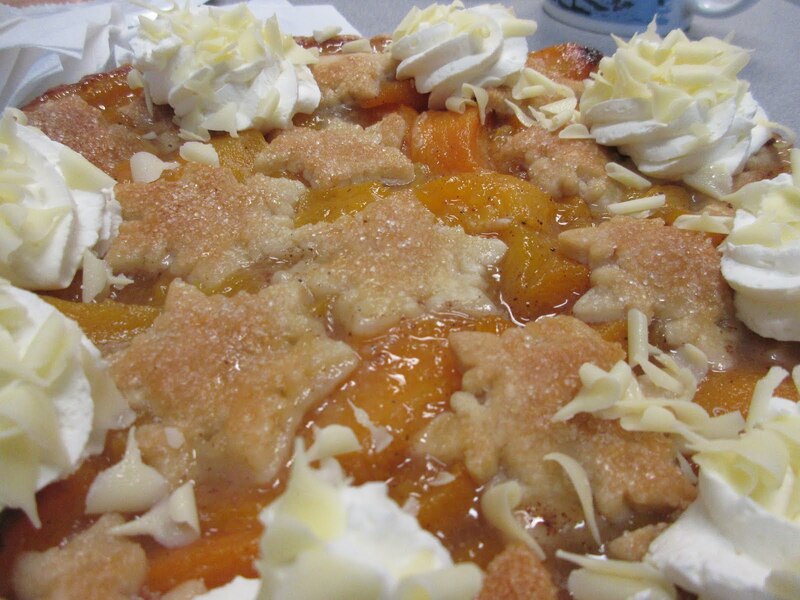 The bottom crust is thicker than in a pie and the amount of filling in considerably less. This is not a bad thing when it comes to a pecan pie sourced thing. The filling- largely corn syrup and sugar - can get pretty sweet when there is about and inch of it as in a pie. Here it is half an inch or less cutting back on the sugar high. Just about the right amount of filling! The layer of pecan's baked into the top is classic and there are several florets of whipped cream adorning the surface. It was very good, as to be expected from this bakery, with a solid crust about the right amount of filling and abundant pecans. It is not as good as another pecan pie we have cooked with eggs and cognac but that's okay. If you got some of the whipped cream it was an added bonus! Abundant pecans best with some whipped cream. A Viennese Lemon Tart courtesy of Trader Joe's was today's cake hour selection. Most of what comes through Trader Joe's is very respectable and this was no exception. It was very similar to a lemon flan tart. Round in shape with a typical flour crust tart bottom. On top of this was a lemon curd that was then dusted with powdered sugar. Since some of the sugar dissolved into the curd it made for an interesting look on the surface. A bit like looking at the surface of the moon. A touch of Vienna via Trader Joe's. Typical fruit tart like shape. The surface of the moon-like top thanks to absorbed sugar.. 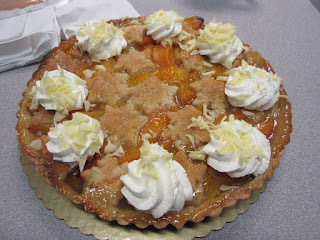 This tart was very good especially in that it was not too sweet which is always a good thing to us. The description on the package gave us the English word of the day to teach our ESL colleagues. Lemon curd for a puckery taste and sugar top to offset it. It says "a rich dessert with a puckery lemon flavor." The meaning of puckery, which the spell check does not recognize, was explained as well as the relation to the verb to pucker. In addition to understanding now that puckery refers to what happens to your lips when you taste something sour, everyone now also knows what to do when they are told to "pucker up". Grab a piece and pucker up! Today's offering was something new brought to us via Formaggio - a gourmet shop in Cambridge and Boston's South End. It was in a box and was called Sbrisolada. Once we opened it, we thought it was some kind of coffee cake although rather flat. That was because of the streusel type top. But it was indeed different. Rather flat box for a cake! Looks like a coffee cake in a bag. We looked it up and learned that Sbrisolada comes from the historical city of Mantova in Italy’s Lombardy region, just a few kilometers from Pasticceria Perbellini, which is the name on the box. The name for this almond biscuit cake derives from the local Mantova dialect ‘Brisa’ meaning crumbs. The crumbs are formed as pieces are broken off by hand and eaten as is or after being dipped in sweet wine or a spirit such as Grappa. 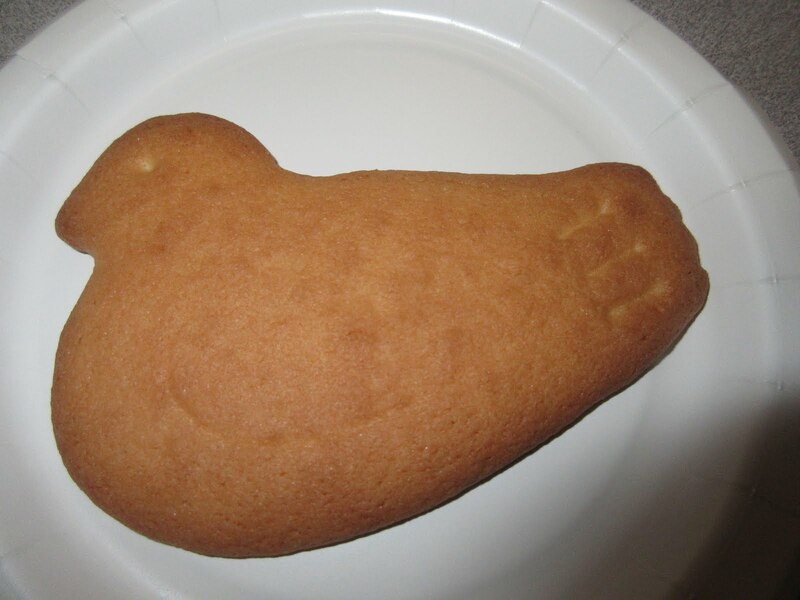 ....it's actually a almond cookie. Like a flat round biscotti! Almond biscuit is a good description as it was much more like a cookie or shortbread cookie with almonds and a crumbly top. It was rather hard and dry, which was not a bad thing at all as this went will with a up of coffee. (No, Grappa at cake hour.) We tried cutting it but ended up breaking it into pieces. It tasted very good - almondy with hints of lemon reminiscent of biscotti - and it was indeed fun to have an unfamiliar but yummy treat! Crunch and crumbly as the name implies! Something sweet from Something Sweet Inc.